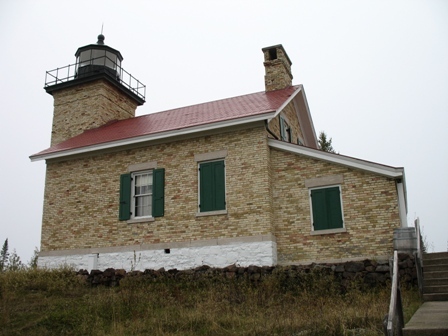 Lansing – The State Historic Preservation Office (SHPO), Michigan State Housing Development Authority (MSHDA), announced the recent listing of the Copper Harbor Light Station in the National Register of Historic Places. The Copper Harbor Light Station is located at the eastern point of the entrance to Copper Harbor in Keweenaw County. It was one of three light stations authorized by the U.S. Congress in 1847-48 for Lake Superior. The other two authorized that year were Whitefish Point, built in 1848, and Manitou Island, built in 1849. By 1860, nineadditional lights were operating on the southern shore of Lake Superior, including ones at nearby Eagle Harbor and Eagle River. The original Copper Harbor Light was put into operation in 1849 when Copper Harbor was an important entry and shipping point for the growing copper mining industry. The nominated complex includes the 1848 keeper’s dwelling, the 1866 schoolhouse-style lighthouse tower/dwelling, the 1866 privy, and the 1933 steel skeleton tower. The 1933 tower is still an operating U.S. Coast Guard navigation aid. Copper Harbor Light Station is part of the Michigan Historical Museum system, which is operated by the Michigan Historical Center, Department of Natural Resources (DNR). The DNR sought the nomination to bring national recognition to the historical significance of the complex. Copper Harbor Light Station is part of the Fort Wilkins Historic Complex. The light station is open daily (weather permitting), 10 a.m. to 6 p.m., May 28 through September 3. Visitors may tour the keeper’s quarters, climb the light tower, and enjoy interactive displays. Fort Wilkins is open daily, 8:30 a.m. to dusk, from May 14 through October 21. Learn more at www.michigan.gov/ftwilkins. The State Historic Preservation Office coordinates the National Register Program in Michigan. For information on the National Register of Historic Places and other programs of the State Historic Preservation Office, visit http://www.michigan.gov/shpo or call (517) 373-1630. The State Historic Preservation Office also works with nonprofit organizations and local governments and state and federal agencies to preserve Michigan’s historic lighthouses. You can support the preservation of Michigan’s lighthouses by purchasing a “Save Our Lights” license plate through the Secretary of State. Twenty-five dollars from each new plate and $10 for each renewal goes toward the Michigan Lighthouse Assistance Fund.